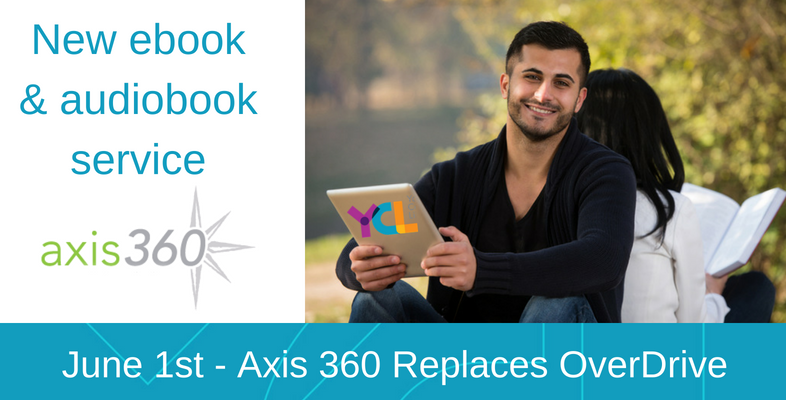 York County Libraries is live with a new digital platform Axis 360. Our content can be reached by using the Magic Wall or by downloading the Axis 360 app for Android, IOS, or Kindle. During the month of June, set up your account and check out an item or place a hold, and you will be entered in a drawing to win an iPad or one of 3 Kindle Fires. The drawing will be limited to one entry per person. You will find that most of our Overdrive content has transferred to Axis 360. What is new and exciting is that we have set up standing order plans for popular fiction authors and series. You will have a similar borrowing experience to Overdrive. Borrow up to 5 items at a time – each with a 2-week lending period. Renew available items. The button will appear next to the item 3 days ahead of time. Receive an email when a hold is ready. You will have 3 days to check it out. Request that YCL purchase a title. This feature is found on search screen, and you will be able to make one request every 7 days. Please note that the Axis 360 system will be unavailable from 10 pm Saturday, June 2 to 12 pm Sunday, June 3 for maintenance. During this time, you will not be able to log in or check out items, however, you can still read or listen to any titles you download prior to the 14-hour downtime. 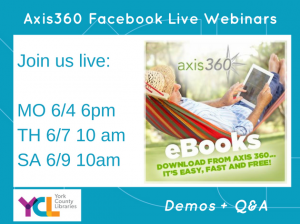 We will be demonstrating the new Axis 360 service and answering questions on Monday, June 4th at 6 pm, Thursday, June 7th at 10 am, and Saturday, June 9th at 10 am. Join us on our YCL Facebook page!